Maitreya's main aim in creating the garden was to provide a peaceful, beautiful area which guests and visitors to the centre could enjoy. So in 1980 he began the process of transforming two acres of flat field and wilderness into a Japanese garden. With no previous gardening experience, he plunged into the task, feeling his way as he went along. As North Clifton was in a flat area, Maitreya missed the hilly and mountainous scenery of Japan and so started to create his own in miniature. The earth dug out by the JCB in order to create the pond was heaped roughly into 'hills' to be shaped by hand later. 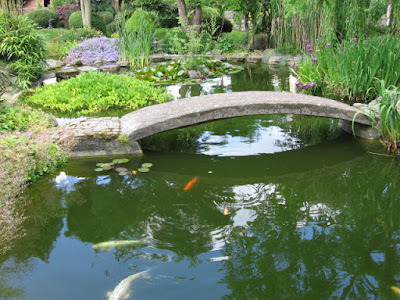 The large stones came mostly from a quarry in Derby and these were spaced out around the pond area to be positioned meditatively and harmoniously one by one. The winding paths took their lead from the positioning of rocks. Then, little by little, the other features were added from the Japanese repertoire of traditional garden elements such as water, carp, bridges, moss, bamboo, evergreens, maples, cherry, stone lanterns, etc... to be blended with a dash of English plants and elements too. A case of East and West in radiant harmony! Many plants were given by friends and villagers, and local farmers helped with the task of ferrying stones. The small pagoda was built using scrap materials he found in the out-buildings, a Zen garden, which consists of rocks and chipped marble, has been completed and a Japanese Tea House for tea ceremony use. Now the world's first - we believe - glittering crystal garden has been completed. On Sunday, May 12th 2013 Maitreya opened the world's first crystal garden in his Japanese garden. The day was well attended and he gave a talk before the grand unveiling. Since Maitreya first had the idea of creating the crystal garden, it has taken four years of devoted work. Maitreya says: "The essence of the crystal garden is for spiritual inspiration, to bring awareness of the beauty of Life and the miracle of creation. When we are aware of Life, which all creation is, we realize the Truth of our self. Without appreciation there is no respect of Life and we are lead by ignorance, greed and fear, which makes our life frustrating and we feel discontent. "When we have awareness of Life and its wonder we respect all life, all beings, and our self. When we love our self, we love all". The crystal garden is Maitreya's expression of the beauty of nature and harmony of creation; mountains, a river, fields, and an ocean are created by countless crystals, gems and precious stones. It is symbolic of how beautiful the universe is.